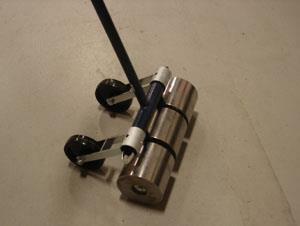 16" wide - 100 lb linoleum roller. All steel construction for trouble free use. Has transport wheels to keep the steel rollers free of contaminants. * Please call us with any questions about our linoleum roller 100lb w/whls rentals in Oak Grove MO, Blue Springs MO, Independence MO, Lexington MO, Odessa MO, Independence MO and Western Missouri.